As millennials mature and enter new life stages, they enter a time of their lives where they are making high-consideration purchases that impact their entire family. Perhaps it's not surprising, therefore, that these important purchases are rarely made alone. 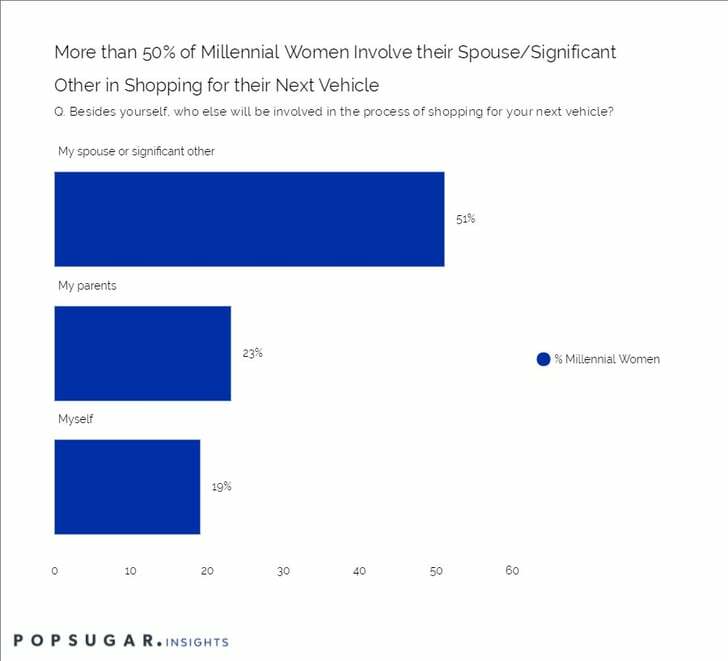 As part of our 2017 POPSUGAR Insights Auto Report, we surveyed over 1,200 US millennial female in-market auto shoppers to better understand their perspective on shopping for their next vehicle. When it comes to shopping for their next vehicle, only 1 in 5 millennial women say that they are going it alone and not seeking help from friends or family. Over one half of millennial women (51%) say that they involve their spouse or significant other in the process, and 23% say they ask their parents for advice on various aspects of the car shopping process.